WALI articulating wall mount for LED LCD TV Monitors, makes it easy to view your TV or Monitor from different angles. Fits TV or Monitor with VESA 100, VESA 75 mounting hole pattern (these are square or rectangular patterns between 3 and 4 inches per side on the rear of your display), maximum loading capacity 33 lbs. 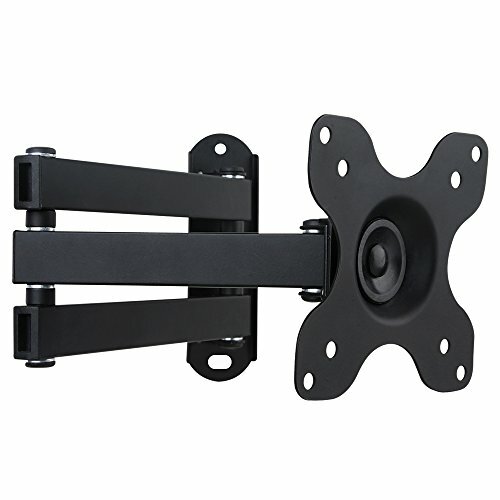 This dual link arm wall mount gives you 14" extension from the wall with maximum flexibility. You can also fold it close to your wall for a low-profile appearance. Removable TV plate designed for single-person installation. Post installation level adjustment to ensure perfect level. Tilt, swivel, extend function provide smooth adjustment for all directions. Durable steel construction with black powder coated finish. Common mounting and screen attachment hardware included. Design: Places TV just 2 inches from the wall to enhance the look of ultra-thin LED TV. Extends up to 14" from the wall. Adjustability: +/-15 degrees tilt; 180 degrees swivel and 360 degrees rotate. Securely mounts to wood stud, concrete or brick wall. Post-installation: Leveling adjustments allow TV to be perfectly positioned after hanging. High grade steel material offers loading capacity to 33lbs. If you have any questions about this product by WALI, contact us by completing and submitting the form below. If you are looking for a specif part number, please include it with your message.